One of the things we decided very early on was to bring Teslagrad to as many platforms as we could. Gamers come in lots of different shapes and sizes, with lots of different preferences as to how they want to play their games. Even here at the office we have a lot of different views on gaming. 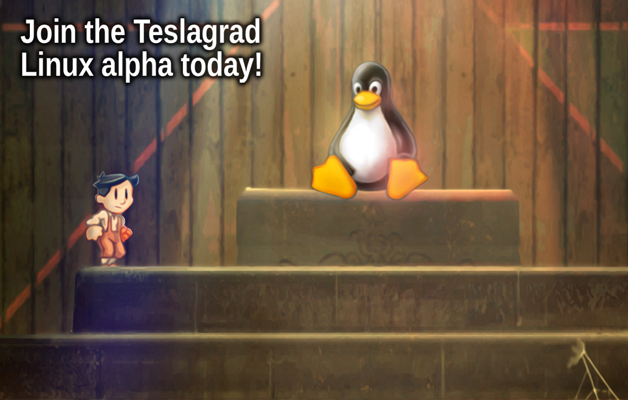 So, of course, a version of Teslagrad for Linux is something we have been wanting to do for a long time, and finally, we have an alpha build ready for testing. So without further ado, let’s just cover what this alpha contains! Take on the role as a young man who finds himself thrown into an ancient conspiracy. Explore the forgotten Tesla Tower and uncover technology long since lost to the masses. Use your newfound tools to traverse the treacherous tower and its dastardly traps and fiendish inhabitants. Innovative puzzle-solving using the power of magnetism and fully functional physics! Exquisite hand-drawn 2D environments that shower you in atmosphere! 100% visual storytelling with a sinister plot where you stand in the center of it all! Explore the vast reaches of the Tower to discover even trickier puzzles and forgotten secrets! This is a completely fresh build, and it sadly is largely untested as our Linux testing capabilities are somewhat limited at the office. That is why we need you, faithful Linux friends, to test the hell out of this version, and help us make this version great. Each gamers want to play one of their favorite genres and most of them prefer a game that has an easy game play and good game concept and of course with a cool graphics.